Senator Steven Bradford (D– Gardena) joined by Governor Edmund G. Brown, Senate pro Tem Toni Atkins (D-San Diego), Assembly Speaker Anthony Rendon (D-Lakewood) and the Black, Women, API, Jewish, LGBTQ, and Latino Legislative Caucuses were all in attendance to welcome Debbie Lumpkin of Los Angeles, as Deputy Inspector General for Diversity and Small Business Development in the Office of Audits and Investigations at the California Department of Transportation (Caltrans). The Office of Audits and Investigation is responsible for services that assist Caltrans management in accomplishing Caltrans objectives, setting priorities, and improving accountability to diverse community groups. “Getting me to yes was because of the governor’s early and strong commitment to diversity. It was critical that diverse, minority interest be a part of this major project of rebuilding our infrastructure. “ The language of the law must consider the various diversity caucuses we have here in the California statehouse. It is not enough for minorities to just drive on our roads, it is our responsibility to create an opportunity for men and women, and black and brown communities to benefit from the contracts that will be created by SB 1,” the Senator continued. Senator Bradford, Vice-Chair of the California Legislative Black Caucus, is a strong advocate of diversity and business development. During the negotiation of ‘The Road Repair and Accountability Act of 2017’ (SB 1), the Senator was not convinced on the prospects of the proposed legislation or the impact it would have on Californians from raising taxes. Senate Bill 1 took effect in January of 2018. Debbie Lumpkin the newly appointed Deputy Inspector General for Diversity and Business Development started in March of this year. Lumpkin’s goal is to create a multitude of programs and opportunities for people of diverse backgrounds, ensuring all communities are aware they can apply for SB 1 contracts. “This position has the potential to impact all community groups that represent the great state of California”, said Lumpkin. Debbie Lumpkin is a founding partner of a consulting company launched in 2013 that represents major corporations and diverse communities nationwide. 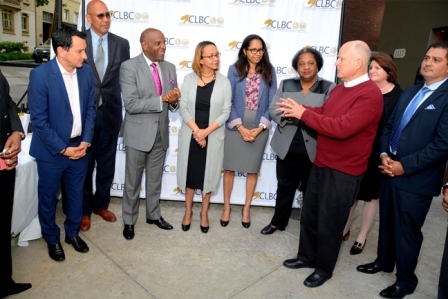 Remarks at the reception were given by: Governor Edmund G. Brown Jr., Senate pro Tem Toni Atkins, Assembly Speaker Anthony Rendon, The California Legislative Black Caucus Chair Asm. Chris Holden (D-Pasadena), the California Latino Legislative Caucus Chair Sen. Ben Hueso (D-San Diego), and the Chair of the Asian Pacific Islander Caucus Asm. Rob Bonta (D- Oakland).